BROOKLYN OAK 2 DRAWER BOOKCASE THE BROOKLYN RANGE IS MADE FROM 100% SOLID OAK AND IS FINISHED WITH TEAK OIL. 2 Adjustable shelves DEPTH 300mm HEIGHT 1908mm WIDTH 890mm FREE DELIVERY WITHIN ENGLAND AND WALES. FOR SCOTLAND PLEASE CALL 01492 642224. 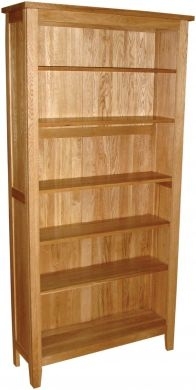 BROOKLYN OAK ALCOVE BOOKCASE THE BROOKLYN RANGE IS MADE FROM 100% SOLID OAK AND IS FINISHED WITH TEAK OIL. 4 Adjustable shelves HEIGHT 1870mm WIDTH 580mm DEPTH 300mm FREE DELIVERY IN ENGLAND AND WALES. FOR SCOTLAND PLEASE CALL 01492 642224. BROOKLYN OAK LOW BOOKCASE THE BROOKLYN RANGE IS MADE FROM 100% SOLID OAK AND IS FINISHED WITH TEAK OIL. One adjustable shelf DEPTH 305mm HEIGHT 870mm WIDTH 1370mm FREE DELIVERY IN ENGLAND AND WALES. FOR SCOTLAND PLEASE CALL 01492 642224. TREND 1 DOOR OAK BOOKCASE Oak handles on the drawers. All drawers are dove tailed for strength. There are over 30 items in this range The Trend range has an oil finish showing the grain of this gorgeous oak to it’s full potential. H 1900 x W 800 x D 400mm FREE DELIVERY TO ENGLAND AND WALES. FOR SCOTLAND PLEASE CALL 01492 642224. TREND SMALL OAK BOOKCASE Oak handles on the drawers. All drawers are dove tailed for strength. There are over 30 items in this range The Trend range has an oil finish showing the grain of this gorgeous oak to it’s full potential. H 1050 x W 915 x D 350mm FREE DELIVERY TO ENGLAND AND WALES. FOR SCOTLAND PLEASE CALL 01492 642224.